Helping medical students maneuver the path to residency is the focus of an IU School of Medicine blog that debuts this week. Michael McKenna, assistant professor, Department of Pediatrics and associate program director for the pediatric residency program, shares insights and experiences gained in his work mentoring students over the past eight years. McKenna’s first entry “Your life is not graded” encourages students to look beyond scores to follow their own passions. Visit the blog at http://blogs.medicine.iu.edu/mckenna/. Better health care for older adults and better training for those who care for them are the goals of a new Indiana University initiative for which clinicians and educators recently received a three-year award of nearly $2.6 million. "Our goal is to improve health outcomes for older adults with teams whose members are trained in the same models of geriatric care and who are able to maximize engagement by family members and the patients themselves," said Project Director Steven R. Counsell, M.D., the Mary Elizabeth Mitchell Professor of Geriatrics and founding director of the IU Geriatrics program at the IU School of Medicine. The new IU initiative, the Indiana Interprofessional Geriatrics Education and Training Center, will focus its activities on central Indiana and eight community health centers operated by Eskenazi Health, and, working with CICOA Aging & In-Home Solutions and the Alzheimer's Association, about 5,000 older adults served by those health centers. Over time, Dr. Counsell said, the goal is to expand the system to underserved primary care settings statewide. The Indiana Interprofessional Geriatrics Education and Training Center will provide geriatrics education and training to residents -- young physicians in training -- as well as master of social work, advanced practice nursing and medical students; and emphasize interprofessional training enabling the various health professionals to work effectively in collaborative teams. In addition to working with aspiring and practicing professionals, the new center will train patients and their families, caregivers and direct care workers toward optimizing health outcomes and quality of life in older Hoosiers. With the support of a second grant of more than $3 million from the National Institutes of Health, researchers from the Regenstrief Institute, Indiana University, Brown University, the University of Toronto, and Moi University in Eldoret, Kenya, are building upon their landmark study of Kenyan orphans which found that those living in orphanages were healthier, both physically and mentally, than those living with extended family members. The new study will investigate the causes of this disparity. Care for orphans is a major issue throughout Africa. An estimated 153 million children and adolescents, the majority in low- and middle-income countries, have lost one or more parents. Compared to those living with parents, orphans are at a higher risk of HIV infection, malnutrition, childhood diseases, stigma and discrimination. The new research is a 5-year extension of the Orphaned and Separated Children's Assessment Related to their Health and Well-Being study, known as OSCAR. Half of the 2,859 Kenyan orphans (age less than one year to 18 years when initially enrolled in OSCAR) in the study reside in orphanages and half live with extended family members. From data acquired during the first five years of the Orphaned and Separated Children's Assessment Related to their Health and Well-Being study, now known as OSCAR 1.0, the researchers compared the physical and mental health, nutrition and education of institutionalized orphans with orphans living with family members. With the new funding, the researchers plan to determine what it is about these dissimilar environments that account for differing outcomes. They will also investigate the cost-effectiveness of the different care structures. Click here to learn more about this study and read the full news release. On Aug. 7 the IU School of Medicine distributed the traditional white coats to the Class of 2019 – the largest incoming class in the school’s 112-year history. The new class includes 355 students, officially making IUSM the largest medical school in the nation. During the white coat ceremony, medical faculty presented each student with a short white coat that symbolizes clinical service. Jay L. Hess, M.D., Ph.D., dean of the IU School of Medicine, vice president for university clinical affairs and the Walter J. Daly Professor welcomed incoming students and their families and delivered the keynote address. 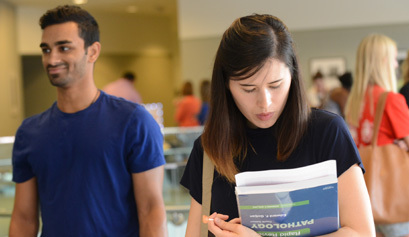 The 355 students will receive four years of training at one of IUSM’s nine regional campuses located in Bloomington, Evansville, Fort Wayne, Gary, Indianapolis, Muncie, South Bend, Terre Haute and West Lafayette. See photos from this event on Facebook at https://www.facebook.com/IUMedicine/. Hal E. Broxmeyer, Ph.D., and Edward Srour, Ph.D., are the principal investigators behind the recent National Institutes of Health NIDDK U54 grant that will fund a Cooperative Hematology Specialized Core Center (CHSCC). It is one of only three such funded centers by NIDDK in the United States and is the top scoring center among all competitors. 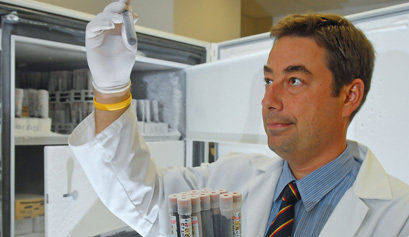 The center brings together 28 scientific and clinical researchers whose activities are focused on various aspects of nonmalignant hematology and whose work is highly dependent on one or more of the four biomedical research CHSCC cores funded, which include Experimental Mouse Resources, Optical Microscopy, Angiogenesis, and Flow Cytometry. The central theme of the CHSCC is the regulation of human and murine hematopoiesis at the level of hematopoietic stem (HSC) and progenitor (HPC) cells. The goal of the investigations is to leverage different components of the hematopoietic system to improve the advancement of the clinical utility and efficacy of HSC/HPC-based therapies. The center’s funding will allow the investigators to better understand basic biological processes that affect hematopoietic stem cell behavior both in vitro and in vivo in a basic science laboratory and to establish clinical trials that transform these findings into translational efforts. CHSCC membership includes a group of well-funded investigators with diverse but complementary experience in experimental and clinical stem cell transplantation, signaling in and regulation of HSC and HPC, developmental emergence of fetal hematopoiesis, gene transfer, interactions between HSC and the hematopoietic niche, mobilization, homing and engraftment of HSC, modulation of function of freshly isolated and ex vivo manipulated HSC, and functional status of HSC after exposure to ionizing radiation. The program includes a pilot and feasibility project that is funded in part through institutional funds to enhance the training of young investigators and to enhance their ability to successfully compete for extramural (e.g. NIH) funding. The center has a well-developed enrichment program to advance the development of both young and established CHSCC members. The CHSCC thus represents an assembly of critical cores and investigators that will advance clinical translation. For the past year, the Industry Collaboration Portal (ICP), an industry partnering initiative at the IU School of Medicine has been actively pursuing research collaboration with pharmaceutical and medical device companies. ICP brings together industry partners and IUSM to share research interests and expertise and to explore potential areas of collaboration. This scientific exchange program has resulted in exposure of more than 50 IUSM researchers and industry leaders to a greater mutual understanding of the research at IUSM and the companies involved. This has been particularly beneficial to local healthcare companies. Several companies, including Eli Lilly, Takeda, Cook, Regentec, Biomet and AstraZeneca have participated in this exchange. Leveraging the strongest areas of medical research at the school, the ICP successfully partners with industry. For example, a recent collaboration with Eli Lilly and Company used human samples and unique animal models available through IUSM to characterize diabetes-related disease. IUSM researchers are also collaborating with Lilly on projects aimed at identifying new targets for diabetes and related disorders. These programs will be further expanded at the newly created Indiana Diabetes Center with an award from the National Institutes of Health. IUSM researchers have also partnered with Takeda Pharmaceutical on pharmaceutical research in personalized medicine and pharmacometrics. With health informatics and the Clinical Translational Sciences programs, ICP has created a research partnership with the Indiana-based medical device company Zimmer-Biomet. ICP is also spearheading the formation of a new Indiana Center for Biomedical Research (ICBI) to house the start-up companies created based on the innovation from IUSM. In partnership with the SPARK program at Stanford University, a new funding and mentoring mechanism is underway to support enhancement of early-stage technologies. In partnership with Indiana CTSI and Indiana University School of Medicine through the office of the Associate Dean for Entrepreneurship and its Industry Collaboration Portal, and the Indiana Center for Biomedical Innovation (ICBI) at IU Health the Technology Enhancement Awards is geared to fill the critical gap between innovation and commercialization. Click here to learn more about this opportunity. More than 80 percent of Americans have a job that consists of sitting all day – whether it’s at a desk, in a meeting or driving. Study after study shows that sitting is impacting people both mentally and physically. Prolonged sitting has been linked to a number of health concerns, including obesity and metabolic syndrome, which includes increased blood pressure, high blood sugar, excess body fat around the waist and abnormal cholesterol levels, according to the Annals of Internal Medicine. Researchers also say too much sitting increases the risk of death from cardiovascular disease and cancer. Researchers from the American Academy of Family Physicians (AAFP) say those who spend at least four hours of nonstop sitting each day have a 50 percent higher chance of experiencing an early death compared to those who spend an average of two nonstop sitting hours. Not only does sitting affect physical health, it also affects mental health. According to the journal BioMed Central (BMC) Public Health, people who spend too much time sitting down may be at an increased risk for anxiety. If standing desks or even treadmill desks aren’t an option for you, consider standing up every 40 minutes or so, even if it’s just to walk to get a glass of water. Setting your fitness tracker or cell phone to vibrate every 40 minutes while you’re sitting, can help you keep track of when to get up and move around. Another option would be sitting on a stability ball, which engages your core muscles. Click here to read the full press release and learn more about how to reduce the risks associated with sitting. Ann Marie Nelson, D.O., has been named interim assistant dean of medical student curriculum in the clinical sciences. Dr. Nelson, who joined the IU School of Medicine faculty in 2011, is assistant professor of clinical family medicine, a position she will continue. Alongside colleagues in Medical Student Education, Dr. Nelson will lead a statewide team of teaching faculty and professional staff to manage the IUSM clinical sciences curriculum. She will provide oversight of the IUSM integrated and competency-based medical student education program and support work in maintaining the clinical sciences curriculum across all nine IU School of Medicine campuses, as well as lead continuing quality improvement of the legacy curriculum. Additionally, she will work closely with the IUSM statewide campus directors, clerkship directors and teaching faculty to enhance ongoing faculty development, recruitment and retention. Dr. Nelson will collaborate with other assistant deans in Medical Student Education to create a seamless transition to clinical experiences in the new IUSM curriculum, the early phases of which will begin in the fall of 2016. Dr. Nelson follows Butch Humbert, M.D., who will focus fully on his recent appointment as program director of the Emergency Medicine Residency Training Program. Dr. Nelson’s appointment was effective Aug. 16. An internationally recognized expert on cancer survivorship will lead the development of a new research program at the Indiana University Melvin and Bren Simon Cancer Center. Lois B. Travis, M.D., Sc.D., has been named the Lawrence H. Einhorn Professor of Cancer Research at the IU School of Medicine and director of the Cancer Survivorship Research Program at the IU Simon Cancer Center. She is also a member of the cancer center’s Cancer Prevention and Control research program, which focuses on prevention, early detection and survivorship. Dr. Travis also will hold an academic appointment in the Department of Epidemiology at the IU Richard M. Fairbanks School of Public Health. The new survivorship program will include research to predict who is susceptible to toxicities in cancer treatment and then alter treatment or develop preventive measures to protect the patient from long-term adverse side effects. The program will not only benefit testis cancer patients, but it has the potential to impact the nearly six million people worldwide each year who are eligible for treatment with a platinum-based agent for 12 other types of cancer. Lawrence H. Einhorn, M.D., an IU Distinguished Professor and Livestrong Foundation Professor of Oncology at the IU School of Medicine, revolutionized cancer treatment more than 40 years ago when he combined the platinum-based cisplatin with two additional drugs. The combination became the cure for testicular cancer. Because of advances in early detection and treatment, more and more people are cancer survivors. It is estimated that there are nearly 14 million American cancer survivors. However, for many, they suffer adverse side effects from their cancer treatments. In addition, Dr. Travis is the principal investigator of a National Institutes of Health study that is open at the IU Simon Cancer Center and other sites around the nation and Canada. The trial aims to identify genetic variants associated with cisplatin-related toxicities, and focuses on testicular cancer patients previously treated at the IU Simon Cancer Center and other major cancer centers. This group of patients is ideal to address these particular research questions, given their young age at diagnosis, curability and relative uniformity of cisplatin-based chemotherapy. Dr. Travis has assembled an international team of experts in oncology, neurology, hearing science, cardiology, statistical genetics, pharmacogenomics and other fields for this trial to better understand the long-term effects of cisplatin treatment not only for these patients, but other groups of survivors treated with cisplatin-based chemotherapy. Previously, Dr. Travis was the director of the Rubin Center for Cancer Survivorship and chief of the Division of Cancer Survivorship at the University of Rochester Medical Center. She also was a senior principal investigator and lead research investigator at the National Cancer Institute, where for nearly 20 years she conducted international studies of late treatment effects in cancer survivors, with an emphasis on second malignant neoplasms. Dr. Travis earned her medical degree from the University of Florida College of Medicine, completed her training at the Mayo Clinic, and obtained a Master of Science in epidemiology and a Doctor of Science in epidemiology from the Harvard School of Public Health. She is a member of the American Association for Cancer Research, the American Medical Association, the American College of Epidemiology and the American Society for Clinical Oncology among others. Dr. Travis was recruited to IU, in part, through the Physician Scientist Initiative. The Physician Scientist Initiative, funded by a $60 million gift from the Lilly Endowment, promotes basic and translational medical science research through the recruitment and training of physician-scientists and investments in biobanking, international programs and research systems. The National Institutes of Health and the National Human Genome Research Institute’s has announced that David A Flockhart, M.D., Ph.D. the Director of the Indiana Institute for Personalized Medicine, Chief of the Division of Clinical Pharmacology at the Indiana University School of Medicine and the Harry and Edith Gladstein Chair in Cancer Pharmacogenomics has been elected as chair of the Implementing GeNomics In PracTicE (IGNITE) Network succeeding Geoffrey Ginsburg, M.D., Ph.D. Dr. Flockhart will be assisted in his new leadership position by newly appointed vice-chair Toni I Pollin, M.S., Ph.D. Associate Professor at the University Of Maryland School Of Medicine. In their role as co-chairs of IGNITE, Drs. Flockhart and Pollin will be the primary spokespersons for the network and will help to direct and consolidate the overall strategic initiatives associated with the genomic research performed at each of the six research sites. IU School of Medicine Dean Jay L. Hess, M.D., Ph.D. and Jack Snyder, chairman of the Regenstrief Institute Board of Directors and the Regenstrief Foundation Board of Directors, recently announced the upcoming departure of longtime IUSM faculty member William M. Tierney, M.D. Dr. Tierney, president and CEO of the Regenstrief Institute and associate dean for clinical effectiveness research, will leave the IU School of Medicine and the Regenstrief Institute in December. Effective Jan. 1, he l will serve as the inaugural chair of the Department of Population Health and the interim chair of the Department of Internal Medicine at the Dell Medical School, University of Texas at Austin, a new school whose first students will be matriculating in 2016. During more than three decades at Regenstrief and IU, Dr. Tierney has held many faculty leadership positions, including chief of the Division of General Internal Medicine and Geriatrics, chief of Internal Medicine for Wishard/Eskenazi Health and associate director of the Indiana Clinical and Translational Sciences Institute. He has helped guide medical informatics and health services research efforts through his personal and collaborative research and outstanding leadership at Regenstrief Institute. Dr. Tierney also played a key role in IUSM’s program in Kenya, leading the team that developed the first ambulatory electronic health record system in sub-Saharan Africa and creating and leading the AMPATH Research Program for eight years. The IU School of Medicine, the Board of Directors of the Regenstrief Institute, and the Board of Directors of the Regenstrief Foundation express their immense gratitude to Bill for his achievements and contributions to the School of Medicine and the Regenstrief Institute. Last month IU School of Medicine-Terre Haute students hosted the Dr. Camp/Camp MD 2015 program, a one-day event that introduces 6th through 12th graders to medicine. The Dr. Camp for 6th to 8th graders included 14 students from local middle schools – and one elementary school student. The Camp MD program for 9th to 12th graders included seven students from local high schools. The day’s events included an overview of the neurological system, a tour of the Union Hospital Simulation Center, a visit to the brain anatomy lab and an overview of brain pathology. Camp participants also received neurology case introductions from EMT, ER, family physician and neurologist perspectives. IUSM counselors included Holly Rose, Shaily Patel, Autumn Menkedick, Harleen Kaur, Hilary Schroeder, Mike Keller, Paul Garverick and Adam Rudolph. The camp also received support from ISU graduates and volunteers, Kenneth Ndife, Natasha Mathew and Bethany McCarty. To see pictures from this event, check out our Facebook page at https://www.facebook.com/IUMedicine. To learn how to get involved next year, or how to enroll a student, visit the Camp MD website at http://www.healthyterrehaute.com/dr-camp. A freedom of expression space called “Medically Speaking” is now available in the hallway between the Daly Student Center and the Van Nuys Medical Science Building. Made up of seven glass boards, the venue provides a physical space to promote humanism, kindness and dialogue about topics of interest to medical students. Students can write, listen or engage with classmates about ideas, topics or issues. Each week Medical Student Education staff will clean the boards and post new questions for medical student and faculty response. For more information, contact Antoine Haywood, Ph.D., assistant dean, medical student affairs at haywooda@iu.edu. Lydia Fisher, a third-year IU School of Medicine student, has helped create a tool to inform children in sub-Saharan Africa that they are HIV positive. While disclosing HIV status to any child is difficult, due to the stigma that still surrounds HIV in Kenya, many parents often delay telling their children they have the virus. Instead, many HIV-infected children taking medications since birth are told they have respiratory issues or another condition unrelated to HIV. Many times during a disclosure session, Rachel Vreeman, M.D., Fisher’s supervisor, would sketch an illustration to help explain to children the importance of therapy and why they need to continue taking the medication even though they no longer feel sick. Fisher, noting how these sketches and illustrations were useful, combined skills from her undergraduate education in graphic design with her medical school knowledge to develop a cartoon video that health care providers and counselors can use during disclosure sessions. “The idea is that counselors would be able to play the video on their iPad or smartphone for the children, making the disclosure tool mobile and easy to use,” Fisher said. The video has already been rolled out and is currently in use with specially trained AMPATH HIV-disclosure counselors. Watch it here in Swahili or in English. For students who need to commute to campus, the IndyGo Red Line offers a simple and affordable solution. The Red Line provides a downtown circular route that mainly services the IUPUI campus. Buses will travel on University, New York, Ohio, West and Michigan as they cover downtown and circle the IUPUI perimeter. Buses will run every 15 minutes from 7 a.m. to 10 p.m. Monday through Saturday. The route offers quick access to IU Health University Hospital, the IUPUI Campus Center, the Herron School of Art, City Market and the National Institute for Fitness and Sport (NIFS). The College S-Pass allows local universities to purchase a 31-day bus pass for students at half price. Passes are $30 each, compared to the $60 fee for a 31-day pass for non-college students. Passes can be used on all bus routes and must be purchased by a college or university employee. Learn more about the S-Pass at http://www.indygo.net/fares/. View routes, learn about closures, plan your trip, download a pdf map and see pick-up times online at http://www.indygo.net/route/50-red-line/. Pete Deckard is in a category all his own. For the past 24 years, he worked as an electrician’s apprentice, foreman and electrical contractor. Directed by his experience as a first responder for his local volunteer fire department, Deckard decided to pursue medicine and enrolled in his first college class at the age of 42. In just the past three years, Deckard has earned a bachelor’s degree, cared for his father with Alzheimer’s disease, served as a medical provider with Project Helping Hands in Kenya, volunteered at his local fire department and delivered more than 4,000 pounds of food to a primary school in Nairobi, Kenya. This fall, Deckard begins a new journey: medical school. After 20 years in the electrical construction industry, including nine years as an owner, my interest in performing electrical work had declined. To fill in the slow days with something meaningful, I joined the local volunteer fire department. Prior to this time, my interest in medicine had revolved around obtaining the best care possible for my parents and children. Our department requires first responder training, and this is where I first experienced patient care from the other side. Eighteen months later, I closed my electrical contracting business that worked primarily at Purdue University-Lafayette, started EMT classwork, and enrolled full time at Ivy Tech-Lafayette with the eventual goal to become a medical doctor. Three years and one summer later, I continue that goal on the Muncie campus of IUSM. Emergency medicine is my current goal. I chose IUSM because of its geographical location and reputation. Ivy Tech and IU Kokomo; general studies with a minor in chemistry. What did the White Coat Ceremony mean to you? To me, it means undergoing a major life change at the age of 45. It makes me grateful to live in a country where this is an option – that our lives are not directed by forces out of our control. I’ve been a youth baseball, basketball and football coach for many years, including seven years as a middle school football defensive coordinator. Most recently, being a firefighter has consumed a great deal of my time. It’s a challenging, but rewarding experience. I also enjoy tutoring EMS classes, traveling, hunting, fishing, skiing and hiking. The application deadline for the following IUSM internal grant programs is 5 p.m. Tuesday, September 1, 2015. If an investigator would like an administrative review of the application components to ensure compliance with the posted submission guidelines, he/she must submit the proposal to iusmoper@iupui.edu five business days prior to the deadline. For this round the administrative review deadline is: August 25, 2015. A new support program for early-stage technologies, the Technology Enhancement Awards, is accepting funding proposals from IU School of Medicine researchers and founders of start-up companies engaged in advancing early-stage technologies to commercialization. The technologies may include highly promising therapeutics, diagnostics or biomedical devices. The awards are sponsored by the Indiana CTSI and the IU School of Medicine through the Office of the Associate Dean for Entrepreneurship. The chosen project will receive funding up to $50,000 for a period of 12 months through a milestone-based project management mechanism. Applicants must be researchers, including post docs, within the IU School of Medicine. Post-doc applicants will need to submit a letter of support from the primary faculty mentor and the department chair. Applications are due by 5 p.m. Oct. 1. The application form with specific content is available at icp.medicine.iu.edu. For more information, contact Padma Portonovo at pportono@iupui.edu. Proposals are requested from Indiana University School of Medicine researchers and founders of startup companies for funds to advance early stage technologies to commercialization. The technologies may include highly promising therapeutics (small molecule or biologics), diagnostics or biomedical devices. The funds will be used in support of closing the technical data gaps for commercialization. The project will receive funding up to $50,000 for a period of 12 months through a milestone based project management mechanism. In addition, advice and mentorship from experts in drug, diagnostics and business development will be available. It’s the Dog Days of Summer, but staff from the IU Simon Cancer Center’s Clinical Trials Office made it possible for a snow blower – and a lawn mower – to be donated to the SON (Serving Others’ Needs) Foundation this week. While performing a service project in June at the SON Foundation, staff from the Clinical Trials Office realized the foundation had a need for lawn equipment. Clinical Trials Office staffer Eric Borchardt got the ball rolling by contacting his father, who works at Ariens, a leading manufacturer of lawn equipment. Ariens graciously agreed to donate the two pieces of equipment, which were presented to the SON Foundation on Aug. 4. Throughout the year, the Clinical Trials Office staff performs a number of volunteer projects as a way to give back to the community. The SON Foundation provides affordable housing to cancer patients, caregivers, and family members. Find more information about this news at http://www.cancer.iu.edu/news-publications/CTO_volunteer.shtml. To kick off the 11th annual Miles for Myeloma, the IU Melvin and Bren Simon Cancer Center will once again host an “M4M Spin” event from 8:30 a.m. to 4:30 p.m. Sept. 8-9. The event will be held in the lobby of the IU Simon Cancer Center, 1030 W. Michigan St.
Cyclists will ride one bike for one-hour increments, while friends, family, caregivers, medical staff, researchers and all others are welcome to sign up for 15-minute time slots on a second bike. Time slots are kept short to promote accessibility, but participants are welcome to sign up for multiple consecutive time slots. The stationary bike is open to all patients, family members, friends and caregivers and offers 15-minute time slots on a bike with a back support. Click here to sign up for a stationary bike time slot. Current and former M4M cyclists can sign up to ride a road bike on a trainer for a one-hour time slot. Click here to sign up for a road bike time slot.